Hosni Auji and Majd Akkar are the sort of people you can’t help but wish well. Auji, a graphic designer by training, and Akkar, a 3D artist and coder, had always hankered to create something of their own. Longtime friends, they joined forces a few years ago for a competition run by the Dutch embassy in Beirut. They later quit their jobs and worked odd hours in order to create Zero Age, their acclaimed indie puzzler game. Sitting with Auji, you can’t escape his sense of bewilderment. Two and a half years of his life have been turned upside down, largely by a girl in a wizard’s cape and a pointy hat. A freshly minted game designer today, he says, “My whole life I was interested in games, but when I was younger it just wasn’t viable. You got these games, they came from Japan, you don’t know how they’re made, you just play them. It didn’t seem like a career path you could consider.” And neither was film directing — he had headed to Prague to study film after graduating from AUB in graphic design — “[it involved]too much man management, I was too scattered,” as he puts it. So he took the pragmatic course and returned to Beirut, where he worked for the design studio Penguin Cube. Over time, Auji began to think about game design, as did Akkar. A catalyst appeared on the horizon when, in 2012, the Dutch embassy managed a game contest and the pair dived in. They created a demo, which gained them entrance to the competition and then, they took the leap. They quit their jobs. Five months later, the two had completed their game, it moved from PC to iPad and it didn’t resemble the demo at all. They had a concept down, and the seeds of something greater. They won. With the $10,000 prize money, the friends gave it a shot, polishing it to become Zero Age. After four months, and many changes of course, the concept was locked down. Zero Age is, in Auji’s words, “A 3D puzzle adventure for the iPad, but it requires lateral and spatial thinking.” It’s simple, but also brutally hard. You move a small girl dressed as a wizard around an isometric grid, on which there are blocks that shift in certain directions. You use the blocks and your various powers to move. It’s the sort of game where a single level can take hours and progress is often glacial. It’s also addictive. The way they designed it is as follows: they decided on an interface, whereby you tap on a node to move things around, later adding the concept of fixed nodes. 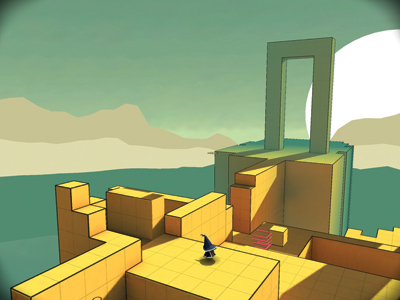 They created puzzles, added an ability, tested it, added another ability and tested again, until they were combining multiple functions in one puzzle zone and elements from separate puzzles to create new, interesting levels. Creating the puzzles and ironing out kinks was a laborious process and the game was increasingly deconstructed. Days ran into weeks, weeks into months. By December of 2013, the pair expected to launch in April of 2014, but for every bug they removed, another appeared, “The task list just grew, you fix one problem, you add two more, it just never ended,” said Auji. At that point, they hadn’t marketed the game at all, and there was no audio. These delays led to their musician dropping out and, desperate for sound, Akkar came upon the idea of using music by Sergei Rachmaninoff. “There was no money for licensing, nothing!” said Auji. Rachmaninoff’s works were in the public domain and the licensing fee was relatively small. The name also came late in the game — they settled on Zero Age, a term that refers to a stage in the evolution of a star, for reasons that will become apparent when you play the game. With October 2014 came the time to publish. Submitting to the App Store is a fraught time, developers can face rejection if Apple isn’t satisfied and Auji and Akkar were novices. “After two weeks, we got an email telling us the App was being reviewed. Forty five minutes later, bang, an email saying it’s been approved.” Auji couldn’t believe it. He assumed, incorrectly, that the process was automated. It took 20 minutes to find the first bug. Auji’s parents downloaded the game and he saw a graphical glitch. It didn’t appear on his machine, nor Akkar’s. “Majd got on it, he had an idea about what was wrong. He did it really quickly, but then we had to submit the patch to Apple and wait again,” he said. 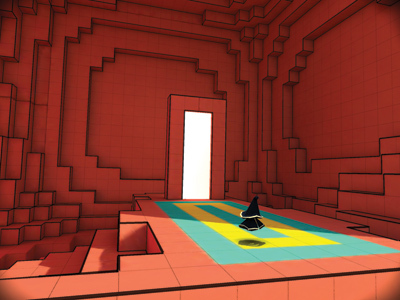 It was approved and Zero Age had a day zero patch, the developer’s nightmare. Emails flew and Pocket Gamer covered them, a few others too. Sales sat at 20 or 30 a day. One morning, Auji woke up and checked their statistics: they had sold 300 copies in a day. It could only be Apple. “A week after launch, we were on the App Store’s main page. We were Game of the Week,” he said, eyes wide, “It was crazy!” Sales hit 400 a day for a week. News sites got in touch and as discounts drove further sales, they were shortlisted for Casual Connect Europe’s Indie Game Awards. In no time, they were all over the internet. At present, Zero Age sits at 72,000 downloads and has brought in around $10,000. Sales currently hover around $300 per month — the game business isn’t necessarily a money making one. Auji smiles, “It’s not enough for two years work, so, we’re planning on releasing it on Steam, the PC and Mac distribution system, and Apple’s Mac store.” The future looks promising from here: a launch, on other platforms, supported by a marketing drive, is sure to bring in additional revenue, but it’s perhaps the hints as to what’s possible that are most interesting. “Once we’ve done Steam and Apple, I’ve got a few side projects. Majd wants to do a fighter,” says Auji. They’d do things differently next time around; “we’d certainly market more,” he says. The learning curve was steep, but as a first step, Zero Age has to be seen as a success. The two have proved they can create a fun, visually stunning game, and the confidence it has given the pair suggests a bright future, once the dust finally settles.